Apollo 11 is in Theaters Now! Heads up that Apollo 11 is in select theaters for a limited time right now! If you enjoy documentaries about space, please take note! This documentary of the Apollo 11 mission led by commander Neil Armstrong and pilots Buzz Aldrin & Michael Collins shows everything that surrounded the plan to land on the moon. We studied space in our homeschool a couple years ago so this looks like it would be an interesting thing for our kids to watch! For more information, check out the Apollo 11 movie trailer. Check your local movie listings to find a theater featuring this movie near you. FilterEasy – Free First Month of HVAC Filters Shipped Right to Your Door! I don’t know about the rest of you, but I really like things that ship right to my house so I don’t have to make special trips to stores I don’t often visit. 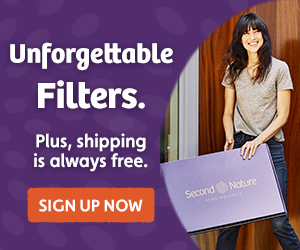 Right now, you can try FilterEasy for FREE and even shipping is free! I tried it a few weeks ago and it was a great experience. I was able to pick the filter I needed for my house (2 in our case) and BOTH were completely free! After your first free month, you are automatically enrolled in deliveries, but you can set up how often you’d like them. We think that the filters worked great and the price was fairly comparable to other places and I didn’t have to leave the house to get them. If you decide it’s not for you, cancelling is easy! Simply send FilterEasy an email and they will get you cancelled. Dairy Queen: Free Cone Day – March 20th! So exciting that spring is almost here! With spring comes Dairy Queen’s Free Cone Day on March 20th. Customers can receive a free small vanilla cone at participating, non-mall locations. Limit one per person. I love taking the kids to this event! Have fun! Teva Olowahu Sandals as low as $11.11! If you can wear a girls shoe size 5-7, you can score Teva Kids Olowahu Sandals as low as $11.11!!! That is an awesome deal! Girls size is approximately 1.5 smaller than women’s size, so if you wear an 8, you can get a girl’s 6!!! Grab this deal quickly as this price is sure to not last. If you’re in doubt, Teva has become my favorite summer sandal brand. Amazon offers free return on many sizes as well! So many places are starting to require clear bags to come in to their facility. Right now Amazon has this clear stadium bag for $8.99 but the deal gets better! Use code 5097TPYU to save 50% off! The Pilgrim’s Progress Coming to Theaters Easter Weekend! My kids and I were given a sneak peek and it was everything we thought it would be, and more! This movie is coming to select nationwide theaters on April 18 and 20th only! You can find tickets at a theatre near you by clicking here. I have 3 codes to giveaway for an interactive, digital adaptation of THE PILGRIM’S PROGRESS! $20 retail value! Simply leave a comment and tell me who your favorite character is from the book. 2 Months of ABCMouse.com For Only $5! For a limited time, you can score 2 months of ABCmouse.com for only $5! After this, then you can cancel or continue subscribing at their published rate. At this price, it’s a wonderful start to see if it’s something your family will enjoy. We have used ABCmouse.com for many months and my children enjoyed it. It now goes from 2 years of age through 2nd grade! I’m about to add my 3 year old to the program because I think he would benefit from it! Happy Monday! I hope you all had a great weekend! It was so nice to have a weekend where it wasn’t raining! We had a great time at the Touch a Truck event in Athens. My husband was out there passing out goodies with the Sheriff’s Office cars. He loves doing the events! Flirty Aprons: Aprons for Kids and Adults – $10 Shipped! I love Flirty Aprons! I’ve had one for years and it’s still holding up great and looks great! If you need a fun gift for a wedding, mother’s day, or just something for you, they have some great gift ideas! There are kids and adult aprons starting at just $10! Then get Free Shipping with Code SHIPMEFREE from 3/11-3/31. That means you can grab aprons for just $10 shipped! Head on over to check out the selection! Giveaway: Disney On Ice – 100 Years of Magic Coming to Infinite Energy Arena in April! We love Disney on Ice! It’s so fun to see our favorite characters live and skating around the arena. Disney on Ice is celebrating 100 Years of Magic with their show that is coming to Infinite Energy Arena in Duluth from Thursday, April 25, through Sunday, April 28, 2019. You can purchase tickets today! The 100 Years of Magic show will feature more than 50 beloved characters starring Minnie Mouse, Donald Duck, Goofy and featuring an ensemble of Disney Princesses including Cinderella, Rapunzel, Ariel, Snow White and Tiana. The wintry wonderland of Disney’s Frozen also comes to life with Anna, Elsa, and the hilarious Olaf, as they discover that true love is the greatest magic of all. Exciting moments from Disney•Pixar’s Finding Nemo, Disney’sAladdin and Beauty and the Beast will leave the whole family with memories to last a lifetime. Tickets for Disney On Ice celebrates 100 Years of Magic start at only $20. All seats are reserved, and tickets are available by calling 770.626.2464 or visiting www.InfiniteEnergyCenter.com. One lucky reader will win a family 4 pack of tickets to the show on Thursday, April 25 at 7:30 p.m. Simple fill out the Rafflecopter for your chance to win!